Garage door openers are really, really convenient. They are so convenient that they have to break occasionally to remind us of how convenient they really are. 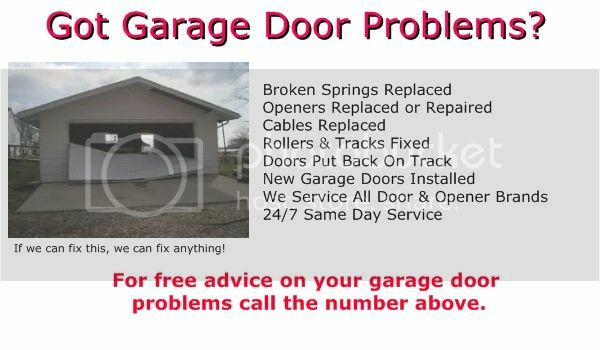 If your garage door opener no longer opens your garage door, call us at the above number. We may be able to point you to an easy fix. Our phone consultations are always free. If not, we’ll be on the way to your home or business with everything needed to fix your opener. When you push the button to open your garage door, you probably just assume it will work. After all, it has always worked in the past. The amazing thing is that garage door opening and closing devices have gotten progressively more sophisticated over the last several decades. There are at three entirely different mechanisms that you can use to open your garage door. There’s the remote, usually used from your car, the interior button and the exterior keyless entry. No longer do people have to drive up to their closed garage door, get out of the car, manually lift the door, get back in the car and drive into the garage. The use of electronics along with limited range, channelized, broadcast frequencies has made that process a thing of the past. Beside electronics, the development of low cost electric motors enabled the convenience revolution when it comes to your garage doors. In the case of garage doors, the electric motor is mounted to the ceiling and connected to the door through a series of chains or belts. The motor activates the chain, belt or rod which moves the rollers either up or down along the tracks that run from the motor and along the sides of it. This is done through the use of pulleys. Now that you have this fantastic convenience, how do you use it? The opening control devices we mentioned earlier in this article are either hard wired to the electric motor or connected through a radio signal. The hardwired button is for your convenience when you are in your home. It is directly connected to the motor, but through wiring, you can place it by your door from the house or anywhere else in your home or perhaps in the garage. You set the remote to the same frequency of the motor and then place it on your visor. Newer model cars come with built-in garage door remotes that can be programmed to any door. The original remotes had one button. Today, they usually have three buttons so you can program each button for a different door. Say you have a detached garage that has an installed garage door opener. Instead of having a bunch of remotes, you can use the same one. As mentioned earlier, vehicles are coming standard with this same remote technology built into the car. So, now you can program these buttons for each door and never have to worry that the battery is dead or that you forgot the remote in another vehicle. If you don’t have your remote, but you want access to your garage, there is another device that gives you access to your house. Usually mounted on your door frame, but outside your door, you can have a keypad entry. This allows you to choose a four digit PIN. When you enter your pin, your door opens. What if the power to your home is out? With a garage door opener with a battery backup system, you can still open your garage door using the opener. More openers are now able to control the lights inside your home as well as the garage door light. When you come home, you can push the remote button in your car and turn on all the lights in you house. You can even set it to turn on the television or any other electrical device. Advancements in the electronics associated with garage doors continue to provide us with the most convenient use of our garage and access to our homes. Who knows what they will think of next. Just wait and see.